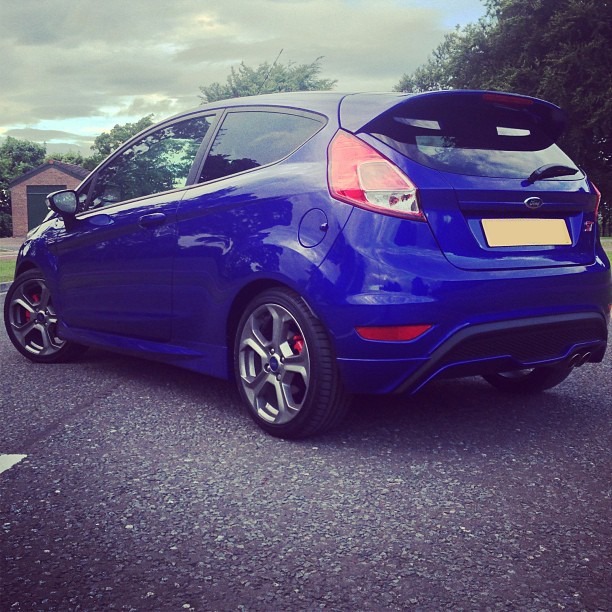 After a last minute decision the day before Ford Fair 2013, Dan and myself decided to lower his Ford Fiesta ST using Eibach 35mm lowering springs, which are available directly from Ford. These springs allow the car to sit lower to the ground, and provide a better handling platform on the Fiesta ST, finally it makes the wheels sit inside the arches more providing a better overall appearance and stance. Following are the parts you require to lower Ford Fiesta ST MK7.5 (2013 to present). First you will need to loosen the front wheel bolts, then jack the front of the Fiesta up, and position axle stands under the car. As we are going to be working on the front struts, you will have to position the axle stands under the bolts which hold the lower wishbones to the body of the car. Once the car has been raised, remove the wheel nuts and remove the wheels to reveal the front struts. First we will need to remove the drop link connection from the Front Struts, this is done by using a 15mm ring spanner and an allen key to stop the bolt from spinning while undoing the nut. You will then need to remove the counter weight (silver box) from the other side of the drop link. As the car is only a few weeks old, all the bolts are easily removed with little elbow grease. Next we need to remove the 2 bolts holding the lower strut to the hub, this is much easier then older models, which used a clamp style method, the new ST is only attached using two bolts this time, which you will require a 15mm and 18mm ring spanner to remove. You will also need to remove the break line retaining bolt which is also attached to the lower strut. Now the lower bolts have been removed, you will now need to remove the upper bolts – This is where a ratchet spanner will help, as its quite tight to get the back bolt (as seen in the image below). Now the strut should be able to be removed from the vehicle, you will need to use your spring clamps to slacken the pressure off the strut top cap, for you to be able to remove the retaining nut. Using your allen key, and your drop neck spanner, of if you have access to a impact gun, or even a pair of mole grips around a socket, and then place your allen key through the hole to undo the top cap. MAKE SURE YOU HAVE COMPRESSED THE SPRING, as it can be very dangerous if you undo the nut and the spring flys away. Fit your new spring (you shouldn’t need to compress the new spring, as two of us were able to compress the new spring enough to be able to get the top nut back on a few threads), and re-fit the front struts in reverse order of removing them. The front of your car should now be complete – Make sure you have tightened all the bolts back up, and re-fit the wheels in preparation for fitting the rear springs. Lower Ford Fiesta ST to the ground and see how much of a difference it makes. Now jack the rear of the Fiesta up, and place on axle stands once again – You can do this part with the wheels on the car still, as it will help in getting the springs out. Once the car is jacked up, you will need to remove one bolt on each side, which holds the rear damper to the rear hub/beam – It is also advisable to have a jack under the rear beam to help support the beam so it doesn’t fall down while your working on removing the bolts. The rear springs should just fall out, or may need a little wiggle. Fitting the new springs can be a little tricky if there is only one of you, as they have a tenancy to just fall out. Place the new springs into the bottom holding plastic bracket, and then put the top of the spring into the rubber cup, then either asking a friend to help you to hold the springs in place while you jack the rear beam up and put a bolt back into the rear shock to keep the springs in position. Once the springs are held in place, tighten both bolts back up and lower the car back to the ground. Your car should now successfully be lowered. Please also keep in mind, the car will get a little lower over the following weeks while the springs bed in. I hope you have made use of this guide to lower Ford Fiesta ST, and saved yourself a £150+ bill at a garage. You will notice a difference in handling a little once they have been changed, and the ride may be a little firmer, but you should get your tracking done after changing the springs as it will knock the alignment out a little. Hi James, car looks great! Stupid question, did you lower it 35mm aswell as the ST already being lowered standard? This is 35mm ontop of the standard lower ST.
Hey.. I would just like to know does this kit fit on the mk7 ford fiesta?.. Yep these are exactly the same springs. Looking good mate, are these the diesel variant springs? If not do you have a Ford part number as I’m desperate for a set of these. These are actually the petrol springs – I am unsure of the part number for the diesel models, but these can easily be requested from your Ford dealership. Will Ford void the warranty if we do it on our own? This shouldn’t void your warranty as this is classed as a Ford Part – This didn’t void the warranty at my local garage, but I cannot say for all garages out there. Got any snaps post-fitting? The lead image on this article looks to me like it’s on stock. This is the only image I have of it as standard, as my brother only had it around a week before we lowered it. As you can see, it sits a lot higher at the back as standard. How much do these springs actually lower the car as it’s already 15-20mm standard? The fiesta ST is 10mm lower then a standard Fiesta and has different suspension setup to be slightly stiffer. Hope you got on well doing this. It was one of the easiest cars to lower. Hey, Thank you so much, sent this to a mate of mine (also called Dan) and we are gonna do it at the end of the month. So nice to have someone who has already done it so we have a guide to follow!! cheers mate!!! Hope it went well. It is pretty straight forward. The hardest part is removing the top cap.